I used two retired Stampin Up! sets: 'Delight in Life' and 'Brighter Tomorrow'. I simply stamped the flower images around one of the edges of the card and colored it in. Then I stamped a sentiment in the large white space left over. The butterflies and bee are three dimensional stickers from K & Co.
And here are close up of the butterflies. I colored the flowers the same colors as the insects to keep the look soft and subtle. Because I used stickers, it was a very quick and easy card to make that still delivers a lot of interest and impact. Hope your husband is better my friend. Beautifully done, Amy...your card is absolutely stunning, and I know it will bring comfort to this family. Great job! 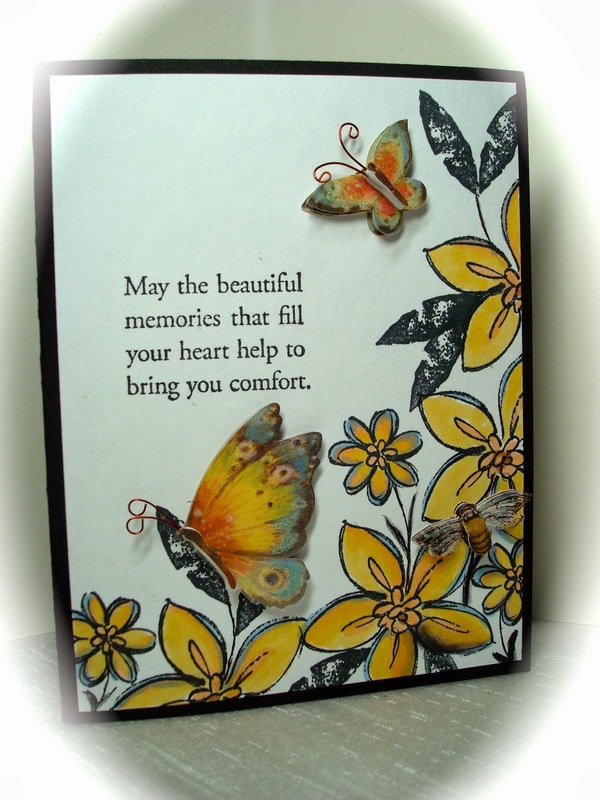 Beautiful sympathy card, simple and meaningful!